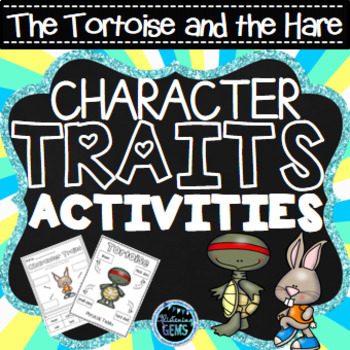 Engage your students with these fun and interactive character traits activities for Aesop's Fable, 'The Tortoise and the Hare'. This resource includes 4 fun filled character traits and physical traits products combined into one bundle! 'The Tortoise and the Hare Activities Bundle' will save you over 25% off! 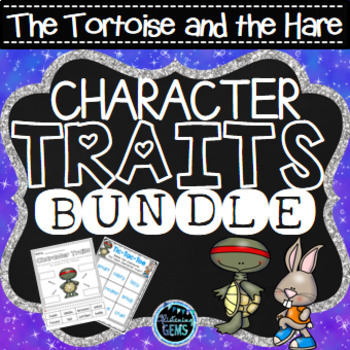 This kit has everything you need to help teach your students about character traits, physical traits, positive traits and negative traits of the Tortoise and the Hare. The differentiated activities include sorting worksheets, cut and paste activities, anchor charts, roll a die activities, yes/no character traits game, Tic-Tac-Toe games, bubble maps, graphic organizers, wanted posters and writing activities! Click on the product covers above to take a closer look. ♥ Cut and paste 4 matching character traits to describe the qualities of the Tortoise. ♥ Cut and paste 4 matching physical traits to describe the appearance of the Tortoise. ♥ Cut and paste 4 matching character traits to describe the qualities of the Hare. ♥ Cut and paste 4 matching physical traits to describe the appearance of the Hare. ♥Answer sheets for cut and paste activities - you can use the answer sheets as anchor charts to display on your bulletin board, so students can refer to them whilst writing. ♥ Who am I activity – Write 3 character trait clues to describe the Tortoise. ♥ Wanted Posters–There are wanted poster templates for the Tortoise and the Hare. Students write what the character is wanted for, and describe his physical traits (appearance). This activity enables students to be creative, and to make up a reason for why the character could be wanted. Maybe the Hare is wanted for being lazy or arrogant! Brainstorm ideas with your class before students create their posters. ♥For students who have a good understanding about character traits and physical traits, they can use the bubble maps to write their own traits to describe the Tortoise and the Hare. ♥Roll a Die Activity - Students will roll a die and find evidence in the story to match each of the character traits. Use the templates to record the character trait and evidence. See example provided for the character trait lazy. Alternatively students could record their responses in their books or on a mini whiteboard. 'The Tortoise and the Hare Character Traits Game', is the perfect activity for teaching your students about character traits! 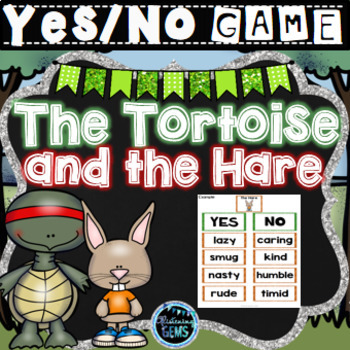 This Yes/No character traits game is a book companion for the Aesop's Fable 'The Tortoise and the Hare', and it will assist your students to make inferences about the characters in the story. Tortoise and the Hare activity will also expose students to a wide variety of vocabulary. This character traits game can be incorporated into your literacy centers, or guided reading lessons! •Students sit around a circular table or on the carpet. Place the headings yes and no in the middle of the circle. •If group of 6 students, give each student 8 character trait cards to place under the yes or no heading. •Students take it in turn to sort their cards under the correct heading. •Ask each student to provide evidence or a reason why they think the character displays that character trait or not. For example the bear is lazy because he had a sleep during the race. •Stick the heading yes in one corner of the room and no in another corner. •Teacher calls out a character trait. Students walk to the yes or no corner. •Select a student to give a reason why they went to the yes or no corner for that particular character trait. •If the students went to the wrong corner then they are out of the game. •Keep playing until you have a winner or small group of students who are left. By playing this game regularly in class students will have a deeper understanding about character traits. This game also assists the teacher with class discussions about character traits and reasons why students believe a character has a particular character trait. Answers may vary with students as they have different beliefs and personal opinions. Want a fun and interactive book companion to help teach your students about character traits? These Aesop fable activities are for the short story, 'The Tortoise and the Hare?' The Tortoise and the Hare activities includes both character traits and physical traits cut and paste sorting activities. This kit also consists of character traits graphic organizers and worksheets to cater for students who have a good understanding about character traits & physical traits. The Tortoise and the Hare worksheets will help students with expanding their vocabulary, and making inferences about characters in order to sort the character traits and physical traits correctly. • Cut and paste sorting worksheet – sort the traits for the Tortoise into physical traits (appearance) and character traits (qualities). 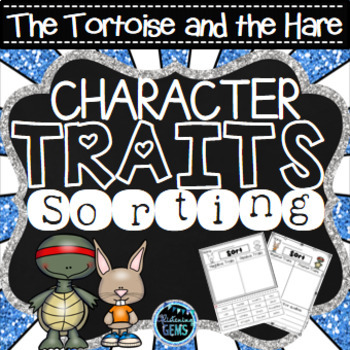 • Cut and paste sorting worksheet – sort the traits for the Hare into physical traits (appearance) and character traits (qualities). • Cut and paste sorting worksheet – sort the character traits into positive and negative traits. • Worksheet - students list their own positive and negative traits to describe the Tortoise and the Hare. Students will describe their positive qualities. • Worksheet - students list what the Hare says in the story and write character traits to match in the table. Students will then write about what they infer about the Hare based on what he says in the story. • Worksheet - students list what the Tortoise says in the story and write character traits to match in the table. Students will then write about what they infer about the Tortoise based on what he says in the story. • Worksheet - students list the Hare’s actions in the story and write character traits to match each action. Students will write what they infer about the Hare based on his actions. • Worksheet - students list the Tortoise’s actions in the story and write character traits to match each action. Students will write what they infer about the Tortoise based on his actions. • Cut and paste sorting worksheet – sort the synonyms and antonyms for the character trait: lazy. • Cut and paste sorting worksheet – sort the synonyms for the character traits: humble, persistent, and confident. • Answer sheets for all cut and paste sorting activities provided. Please see the preview for a closer look at each individual product.